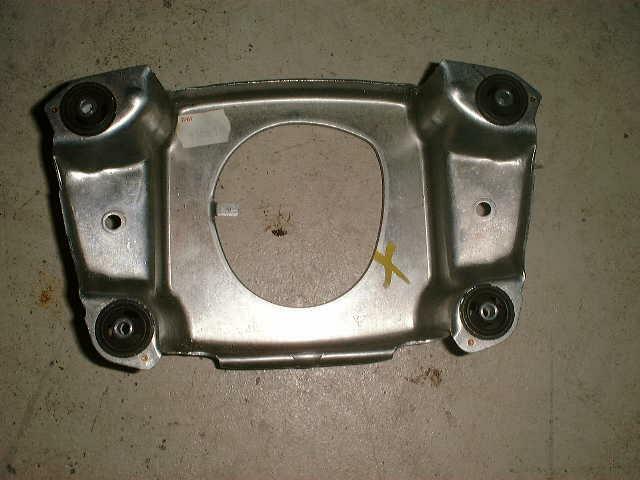 The rubber bushings inside the frame for the 4 spoke steering wheel air bag/horn are worn. Common complaint with the older 4 spoke steering wheels. The air bag is heavy and when it starts to move around due to the worn rubber bushings the horn beeps. It could happen when you hit a bump, hit the brakes, turn the wheel fast, whatever. When someone has purchased an older Box and they say the horns do not work, then you usually find that the horn fuse fuse or relay was removed rather than fixing the problem. 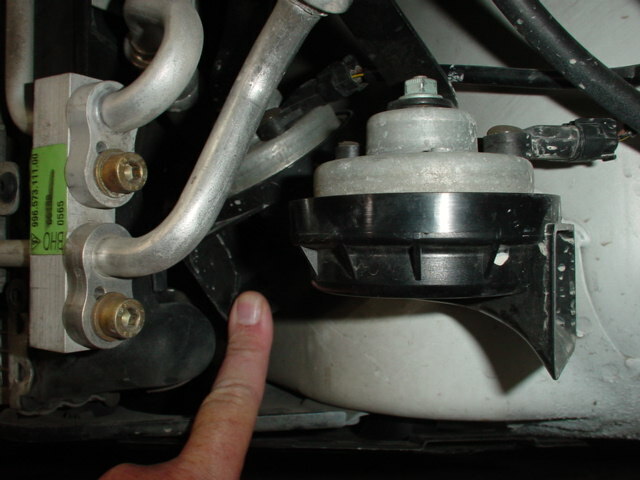 Does anybody have a diagram of where these bushings are located, and what do they look like, and (sorry but just this one more) how are they replaced? The green line is to one of the 4 bushings. My pencil is to one of the 4 horn contacts. When the bushings become worn and relax the frame/metal plate makes contact with the horn contact due to the weight of the air bag, and beep. Porsche does not sell just the bushings. You have to buy the entire frame. 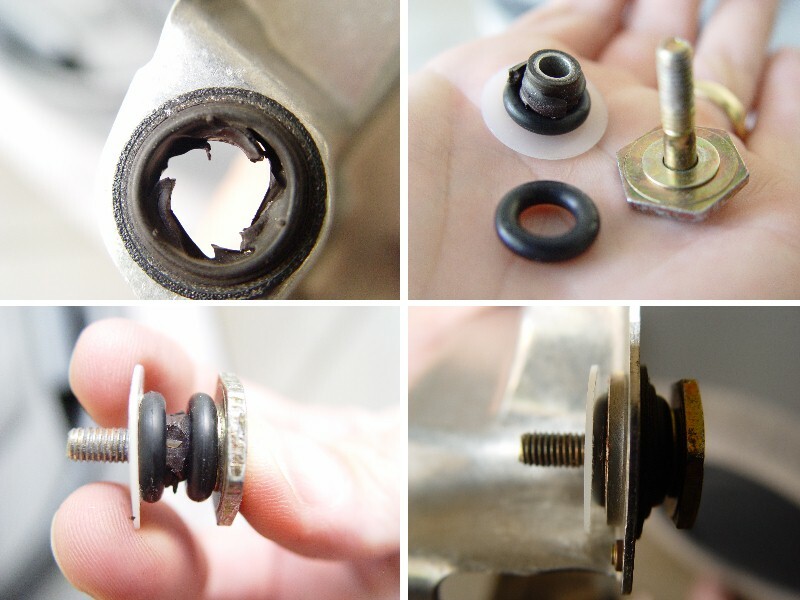 Some guys use slices of garden hose to make the bushings stiffer. Someone else put a spring under each bushing. Thank you very much. This picture is a big help. Now to see how to remove the air bag on a 4 spoke wheel. I would guess they are much like the 3 spoke wheel. The 4 spoke air bag comes off just like a 3 spoke. Disconnect the negative cable to the battery and you need a T30 torx driver for the 2 torx screws behind the wheel. This is the 4 spoke frame. Part number 993 347 088 01. Retail $65. I had to fix my horn earlier this summer as it was stuck in the on position. 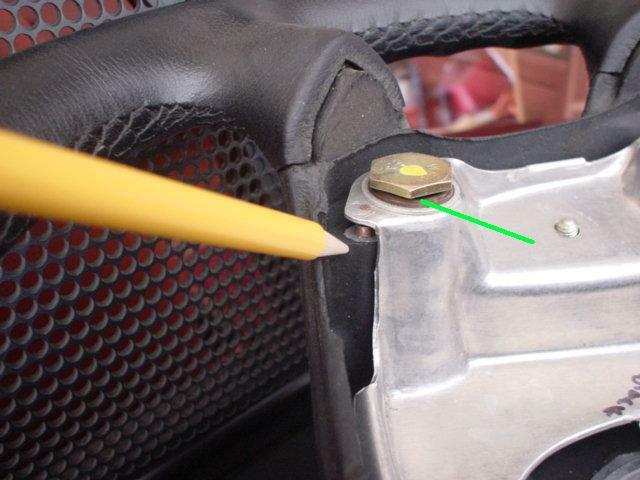 This was discovered when I replaced a fuse – the boxster’s horn are loud in a confined area when not expected. The following image shows the basic concept of how I fixed the horn. The o-rings and Washers were purchased at ACE. The o-rings are made of black rubber and I believe are a #38 size – not positive on size number. The washer is made of white nylon and is 3/8 x 7/8. I used the thinner of the two washers that were available in the above diameter. I removed the old center parts of the rubber piece that was in each of the 4 holes since these were about ready to fall out from deterioration. You need to hang onto the old centers as they are used in the fix as shown below. I left as much rubber attached to the frame as possible as this is what holds and locates the frame between the o-rings. I added a nylon washer to provide some extra clearance between the frame and the contact. I had to tack this washer to the nearest o-ring with a small drop of super glue so that they would stay in place during the assembly to the steering wheel. This fix results in a stiffer horn so it is more difficult to toot the horn with you fingers. The horn does work when needed and does not bounce on the contacts. Excellent. More so since this is such a common complaint with the 4 spoke wheel that we inherited from the 993. Maybe now that the German company that makes steering wheels for Porsche has been bought up by a Japanese company they will start using a normal metal spring instead of rubber bushings. You should put together a repair kit for the 993, early Boxster, and early 996 and sell it to Porsche. I had some extra time over the weekend so I took some pictures of the fix for the horn covered in the earlier post. The o-rings measured .300 x .580 and .140 thick. The nylon washer measured .375 x .875 and .031 thick. The image below shows the hole after the center is remove, the components partially disassembled, the components together, and the components assembled to the frame. Easier fix is to fill the rubber bushing completely with Black hi Temp silicone gasket in a tube available at all auto parts stores. It dries hard and returns the horn to normal operation. For those with the horn problem, I wanted to steer you towards the black hi temp silicone repair. I tried going to Lowe's, Home Depot, and even Ace for the o-ring solution suggested by jporter, but could not find an o-ring #38 or nylon washers of the right spec. Very frustrating. When I took off the airbag, I found that my rubber bushings were all still in place! This intrigued me because everyone else's had tears or even torn all the way through. Nevertheless, the silicone fix has solved my horn problem, and I conclude that my rubber bushings, though still intact, had become exceptionally flimsy, and unable to offset the airbag's weight. Good luck to others with this problem. Update on silicone repair......well over a year since I filled my torn bushings with silicone and the horn still works normally. Great, nice to have a update on repair. Great thread. I just fixed mine with a new frame from Jeff at Sunset. I think it was about $45 shipped. It is nice not having the horn blast every time I hit the brakes. It had gotten so frequent I had to remove the fuse and go without a horn. The rubber bushes were not torn, but were very spongy and soft. Local dealer said I had to buy a whole new steering wheel! Glad I looked here first since I didn't really know which part was failing from the PET diagrams. I just purchased a '99 Boxster and discovered that my horn is not working. Now I have a good guess as to why! Can someone tell me where I can find a fuse layout diagram? Mine is missing from the fuse panel cover where the manual tells me it should be. I'd like to see if my fuse is blown or removed. That would be second row from the top third fuse in from the left. Don't be suprised if it is a bad horn - as you can see above it is a fairly common failure. Thanks Loren. I'll check it out tonight. If I do have to remove the wheel to repair the bushings, what precautions do I have to take with regards to disconnecting battery power? I don't want to end up with any idiot lights permanently on. Fuse B3, 25A, not blown. Still no horn. I also noticed when I touched the airbag there was a relay clicking under the dash. This was very sensitive, I'm betting I need the bushing rework done. But why does my horn not sound? Is it disconnected at the horn itself? Where exactly do I find the horn? I could still use a legible copy of the fuse panel layout. Did you look at your other request for the fuse panel listing? I posted a good copy here. Have your read the other posts about removing the front bumper to get to the horns? They can always be tested with a 12VDC power source. I hate to sound terse but this has all been covered here many many times. If you can hear the relay clicking then it "sounds" :lol: like you have 2 bad horns. Usually just one goes out, and it is usually the one you can see through the opening in the bottom of the bumper cover because that horn exposed to water. The other horn is mounded differently inside the cover so water can't get to it. You can see both horns in the picture. My finger is pointing to the one that usually does not drink water. But, maybe you are the lucky owner with two bad horns. I saw your paste of the fuse diagram. Unfortunately the resolution is so poor it's unreadable. I'll look for the front bumper posts. But maybe you are the lucky owner with two bad horns. Lucky me! Looks like more investigating to be done. Thanks! You do know that you click on the image to make it larger? The larger pic is not easily readable. I have also printed it out. The file is a low-res scan of the original. Your link to the front bumper removal doesn't work either!